The Vampire Diaries Season 1. THE VAMPIRE DIARIES is the story of two vampire brothers obsessed with the same beautiful girl, who are battling to control the fate of an entire town. Stefan Salvatore (Paul Wesley) and Damon Salvatore (Ian Somerhalder), returned to their hometown of Mystic Falls, Virginia, for very different reasons: Stefan was determined to get to know Elena Gilbert (Nina Dobrev), who bears a striking resemblance to Katherine Pierce, the beautiful but ruthless vampire the brothers knew and loved in 1864. Meanwhile, Damon was intent on releasing Katherine from the tomb where he believed she was trapped by a witch's spell all those years ago. 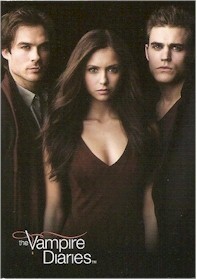 Collect all of the scenes and sights in THE VAMPIRE DIARIES Season One trading card set! Released Feb 2012 - Cryptozoic Entertainment.